And we're back! 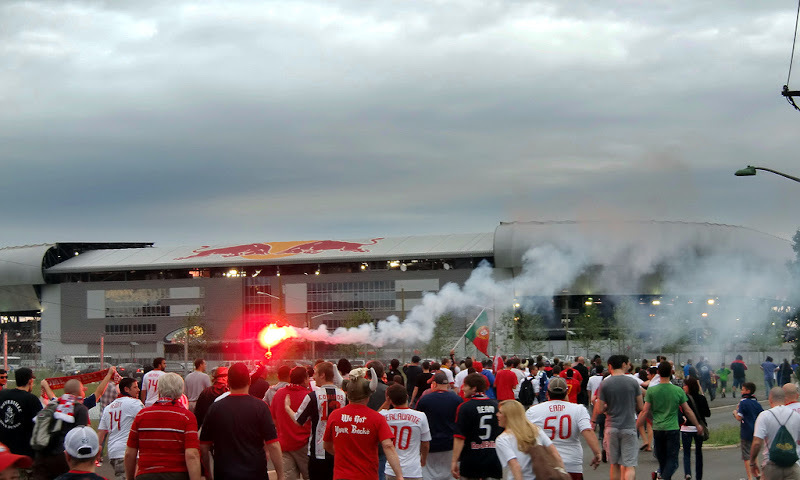 It's matchday, once again, @The Cathedral of Football, Red Bull Arena (built by Makita). Today's opponent is Red Bulls killer Seattle (4:00pm ET, ESPN, match notes here). It's a new-look Red Bulls team this week, with the club acquiring forward Sebastien LeToux and veteran goalkeeper Bill Gaudette via trades. Gaudette might even get the start, as Ryan Meara is nursing an injury. Also, Henry, Marquez and Holgersson might even return to the line-up for this one. Can they stop seattle potent attack today? We can only hope so. With that said, let's get to some predictions! Let's be honest - the Red Bulls have been playing like crap lately. They desperately need to put a string of good results together to keep from sliding further back in the East. Seattle is no pushover however. 1-1 draw. We get a goal from Henry but give one back late. Montero usually kills us in this fixture, and Seattle also has a red hot Eddie Johnson banging in the goals. Taking that into account, I originally predicted a loss here. But because of the Sebastien LeToux signing, I'm going to go out on a limb and predict an RBNY win today, 2-1. Dane did little this season but frustrate the hell out of us, earning runner-up Cow of the First Half from the guys over at Seeing Red. We now have a French LeOne LeToux punch up front with the addition of Sebastian LeToux along side Henry. I think we successfully defend our home today 3-2 (RBNY), with one each from our three strikers. Look for Rafa or Holgy to get burned at least once by Zakuani. Red Bulls will prove "LeToux much" for Seattle. I'm calling it 3-1 RBNY, with goals from an inspired Henry, a scared for his job Kenny Cooper, and from our new addition... Though I wouldn't be surprised at all if things went the other way. We need a big start to this home stand after dropping off the pace of late. The big question mark is between the sticks. I'm guessing Gaudette is here for a reason, but he's veteran enough to slip into the lineup and communicate with a back line that must improve. Can't believe longing for the return of Holgersson; we need to get beyond lapses of concentration. I am excited to see how Le Toux will partner with Henry. Provided someone gives them service, I think we'll have the most potent attack in the league. 2-1 RBNY today over Sigi's Sounders, who will put up a fight. Ok! Hope to see you all today @The Cathedral of Football, Red Bull Arena (built by Makita). Let's go Red Bulls!